Charles Dickens, novelist and humorist, was born at Landport in Hampshire, in February 1812. His father, John Dickens, was employed for some years in the Navy Pay Department, but at the conclusion of the war with France was pensioned, and became a parliamentary reporter. In this pursuit his son was soon distinguished for uncommon ability; and after a literary engagement -- at a very early age -- upon The True Sun, he attached himself to the staff of the Morning Chronicle. In this newspaper he gave the first evidence of his talents in the lively essays, entitled Sketches by Boz, published in 1836. Encouraged by their success, he undertook to write the letterpress of Adventures of Mr. Pickwick, the illustrations of which were to be executed by the then more famous Mr. Seymour, a comic artist. The Pickwick Papers became an enormous commercial success, commencing an era in English literature. It was the first of a series of fictitious works exhibiting the life and manners of the middle and lower classes, which up to that time had had scarcely any exponent. In one respect, however, this book had neither predecessor nor progeny. Neither before nor since has there ever been such a literary embodiment of healthy animal spirits. There is none like it for unflagging but never unwise entertainment -- for humor that is very much the reverse of dry. Since Pickwick, Dickens has given us many works more admirable in other respects. Nicholas Nickleby, his next effort, was, as a story, greatly in advance of it. It was also the first of those social novels which form so marked a feature in the literature of the next hundred years. It was aimed at the wrongs and cruelties inflicted upon their wretched pupils by the cheap schoolmasters of Yorkshire -- and it hit its mark. Since then Dickens has set lance against many a social monster. He may be sometimes wrong, but he can scarcely be accused of want of honesty of purpose; while quite as little can partisanship (except that he is always for the poor) be laid to his charge, since at the very time that the country gentlemen were shaking their heads at him for his lack of reverence for "land", he incensed the manufacturing interest by the publication of Hard Times. His sarcasm is of a rather peculiar character; too good-natured to sneer, and with eyes, notwithstanding their indignant fire, that never lose sight of the ludicrous side of things, his style is mocking argument. After Nicholas Nickeby came Master Humphrey's Clock, containing the Old Curiousity Shop and Barnaby Rudge. In the former of these, and in the character of Little Nelly, he first exhibited that power of setting forth child-life and child-thought which may have been said perhaps, before the publication of George Eliot's works, to be peculiarly his own. Barnaby Rudge was his first, and, with the exception of his subsequent Tale of Two Cities, his only attempt to describe the past; and it was a successful one. It is probably, with reference to plot and circumstance, his best novel, barring David Copperfield. The Old Curiosity Shop began in a curious dreamy manner, which, although obviously a favorite one with Dickens, he soon perceived was unappreciated, and had the prudence to discontinue. This disposition of his mind towards the weird and grotesque he subsequently developed with greater success in his Christmas Stories. After a voyage across the Atlantic, Dickens published in 1842 his American Notes for General Circulation; but a much more admirable result of that expedition appeared in his Martin Chuzzlewit. This was certainly the greatest of his humorous works since the Pickwick Papers, and it may almost be said to have been his last. From this period, his animal spirits -- a rare gift among even comic authors, and rarely lasting so long as in his own case -- appear to have deserted him. His humor, except in some rich creations, such as Mr. Micawber, is no longer so apparent, while, on the other hand, his with and pathos have increased. Dombey and Son was considered a falling off in one who stood so high; but his death of little Dombey brought tears to the eyes of lawyers. When men were expecting that he should wane and weaken like other prolific writers before him, he produced a novel as fresh as the dawn. In this, for the first time he adopted the autobiographical form, and that perhaps offered him some advantages; but at all events, the result was admirable. David Copperfield is perhaps by far his greatest work, and will endure -- though for very different reasons -- as long as the Pickwick Papers. Its Agnes is one of the most charming female characters in the whole range of fiction. Bleak House, Hard Times, Little Dorritt, the Tale of Two Cities, and Great Expectations, have since succeeded one another with almost periodic punctuality, and an audience larger than any English author ever had has awaited each. No prose writer was ever more quotable or quoted than Dickens, and his works hold a unique place in the canon of English literature. The good characters of his novels do not exert a wholesome moral tendency, as many of them act from impulse, and not from the influence of moral or religious motives. 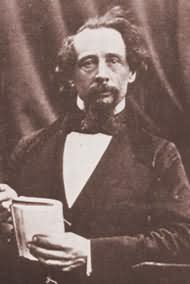 In 1845, the Daily News was started under Dickens' auspices, but he soon withdrew from it. In 1850 he commenced Household Words, which has since been merged into All the Year Round. In 1867 he again visted the United States, and was cordially received. He died 1870 at Gad's Hill Place in Kent.